Does your home have a detached garage that isn’t being used? Or is it being used inefficiently and in need of being reorganized? If you answered yes to either of those questions, it’s time to give your garage a remodel. Upgrade it for improved functionality by turning it into the room you’ve always dreamed of. Whether you’re looking for simple organization ideas or for a complete remodel, the possibilities are endless. Reorganize your detached garage to maximize the space and get the most out of its intended use. Begin by removing everything so you’re starting with a fresh, empty space. Use shelves or labeled storage bins to create a center aisle. Add shelves along the walls for additional storage. Make use of the empty space above the shelves by adding wall hooks to hang garden tools and other items. Before putting anything back inside, ask yourself if you really need it or if it has a real purpose. If not, it’s time for it to find a new home. Creating a home office area outside of the main house will help improve your productivity and allow you a place away from typical household distractions when you need it. If you work from home on a regular basis and need to meet with clients or other business associates, having your office in a separate building helps maintain privacy without the added cost of renting office space. A detached garage is the perfect place to set up band equipment for music practice. Adding soundproof insulation will help reduce noise disturbances to the rest of the family and neighbors and allow the space to double as a recording studio. You may need to add additional wiring to ensure there are enough outlets and power for all the equipment. Instead of spending money at the gym on a gym membership, transform your detached garage into a workout center or dance studio. Determine the type of workout room you want to have – weightlifting, aerobic, cardio equipment, dance studio, or a multi-purpose space. You can divide the space to include hardwood floors and mats, with space along the walls for mirrors or equipment storage. Organize garden tools and supplies, create a greenhouse environment for your garden, or divide the space so there’s room for both. Install heavy-duty wall hooks for hanging shovels, rakes, clippers, and other tools. Place a table in the corner for potting plants, and shelves along the walls or in rows for starting seedlings. Install grow lights and heat lamps for a complete greenhouse environment. the house. This gives you a private, out of the way area to work while keeping everything you need in one place and minimizing disruptions to your living areas. Transforming the detached garage into a bonus room ensures you, your spouse, or kids have a quiet place to get away to and have fun without distracting other family members. 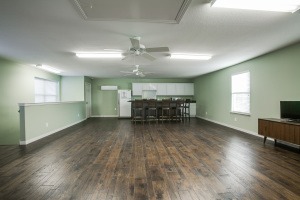 This room is the perfect place for a man-cave, dedicated game room, or a playhouse. 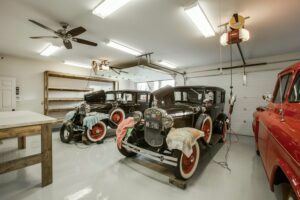 Click here to see more of the featured garage remodel.